The Kickstarter campaign sped past its $25,000 goal, reaching more than $100,000, which the team says will allow it to hire another reporter. The gang had already received some seed funding from a new newsmaking platform, Civil. Blockchain and crypto hype aside, the Civil platform facilitates the business model local news organizations must pursue going forward: a subscription-based service delivering highly differentiated niche content to an engaged community. These sites must be destinations that subscribers seek out, and thus should engage them in multiple ways: in-depth reporting and journalism, yes, but also video, podcasts, and innovative presentation and story design. Additionally, a truly revolutionary news service must harness the power of its readers and develop a community (since DNAinfo died, r/Chicago has been a primary source of local news for me). As Wikitribune is attempting to do, this means drawing on the power of the masses for things like fact-checking and copy editing. Not only does this mean less staffers, but it actually leads to a better product. Unlike print, the nature of digital is iterative: mistakes can be corrected, facts refined. The change goes further than this though. On a fundamental level, advertising-driven businesses are incentivized to reach as many potential customers as possible (Tim Wu has written an insightful book about the history of advertising). This means bundling all types of content together to attract ever more readers: classifieds, sports, lifestyle, comics, etc. The digital age has shattered this bundle across the internet, leaving newspapers hopeless to compete. On the other hand, niche publications with subscription-driven models are creating a product for their customers, the readers. They’ve carved out a well-defined niche, so that subscribers know what they’re paying for, and then deliver in-depth, quality reporting within this niche. These readers demand not a steady stream of click-bait-like content (as advertisers do), but high quality content. After all, I only have time to consume so much news in a day — it better be good, in-depth journalism on a topic I care about. And what do people care about more than where they’re from? More than that though, these subscriptions are selling something bigger: the feeling of being part of a community, of being informed, and of being a good citizen. A quote from one of Block Club Chicago’s founding members seems to illustrate the team understands this dynamic. “We did some math after one of these venture capitalist guys came to us and said ‘if you had three percent of your audience subscribe, you guys would have been completely profitable.’” Jen Sabella, Block Club Chicago’s head of strategy (and DNAinfo alum) explained. The Local news model of the future must continuously engage and monetize these readers. Finally, from a reader’s perspective, there might actually be some value in high-quality native advertising. I want to know about events or openings occurring in various Chicago neighborhoods on any given week — that’s part of the reason I’m reading the site — if someone wants to pay for placing an article on the site, go for it! While the local news organization is focused on delivering quality journalism to its subscribers, what is the new, digital “publisher” doing? Quite simply, making it as easy as possible for these journalists to create content and develop a direct connection with readers. This isn’t a wholly new idea: Vox Media began in 2005 as SportsBlogs Inc., the parent company for the SB Nation network of sites, which has a dedicated blog for just about any sports team you could imagine (American Ninja Warrior fans, rejoice). This hyper-niche strategy has served Vox Media well: it also owns the Eater and Curbed brands, and anyone living in a city with these sites can testify to their value. On the national level, Vox Media has invested in personalities: from bringing on Ezra Klein to launch Vox to hosting Bill Simmons’ The Ringer, Vox brings on individuals with brand cache and frees them to continue doing what they do best — develop content. For its part, Vox has built the advertising network and what by all accounts is a world-class content management system, Chorus. Even the “Amazon–Washington Post”, which Klein left for Vox, has since built its content management system into a nice little SaaS business that it sells to, among others, Tronc, the owner of the LA Times and Chicago Tribune. Civil is following the same model, albeit cutting out the ads entirely and deepening the relationship between readers and journalists by building their platform on the Ethereum blockchain. 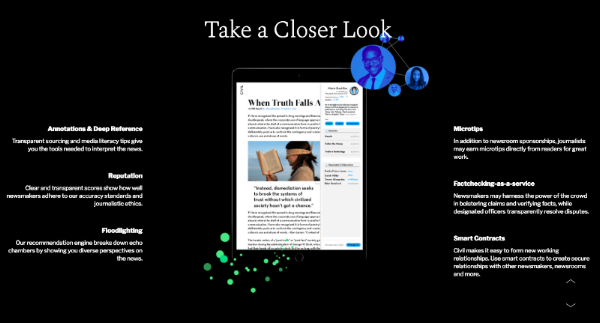 This opportunity for direct connection allows readers to sponsor stories, investigations, and journalists, fostering a sense of ownership in the community. Additionally, Civil’s “first fleet” is a stable of well-defined (and under-served) niches focused on local, policy, and investigative work. Civil’s “first fleet” of publications is focused on what it believes to be under-served niches in the digital age: local, policy, and investigate journalism. Today, we’re announcing that Facebook has over 6 million active advertisers, and we recently announced that Instagram has over 2 million advertisers. The vast majority of these are small and medium-sized businesses…. These businesses often have small ad budgets, so the ability to reach people more effectively is really valuable to them. It’s easy to berate Google and Facebook for the harm they’ve caused journalists (among others), but we’d do well to remember millions of people have created perfectly respectable businesses by leveraging the hyper-targeted ads that Google and Facebook offer. Indeed, in that earnings call, Facebook COO Sheryl Sandberg goes on to highlight LoveBook, a small business advertising on its sites. LoveBook lets you make personalized gift books; I gave one to my fiance after finding them on Facebook, and it really is a great business. But the advertising business model can’t rebuild local journalism. Google and Facebook operate on the principle of centralization, of aggregating as many users as possible and then slicing them up for advertisers. These platforms have allowed for the generation of tremendous value, but a new era of platforms has arrived. These new platforms will be built not on centralization, but on decentralization. They will allow people to build direct relationships: not just readers with journalists or readers with readers, but beyond that. Consumers with farmers, citizens with politicians, listeners with musicians. New communities will be built around these direct relationships; people and projects will be funded, passions will be pursued. Centralization had its era: many great small businesses were built, and a few terrifyingly large ones. But history moves in cycles: as radio and TV centralized around a few conglomerates, the internet came along to disrupt and decentralize. The next wave of blockchain and decentralization technologies will do the same, again empowering individuals to experiment, create, and build communities. The next challenge is making the transition from online to offline (O2O): building a revolutionary technology and then understanding how it can impact what’s happening in the “real” world. Together, Civil and Block Club Chicago may just be demonstrating how this can foster a new era of local journalism. So what industry is next?